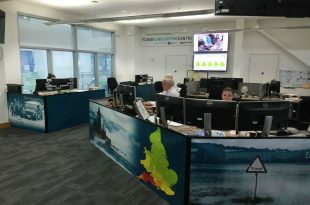 The ultimate job of the Flood Forecasting Centre (FFC), is to help people stay safe when it floods. We do this by forecasting - as many days ahead as we can - where will flood, when it will flood and how long the flooding will last. This helps emergency responders to prepare and reduce the damage caused where possible. In prolonged flooding we also help spot the periods of respite so emergency responders can rest, flood response kit can be moved and new plans drawn up. We’re a partnership between the Environment Agency and Met Office, run from a jointly staffed centre that operates 24/7, 365 days a year. I’ve been the head of the FFC for over four years now and it’s been full of flooding at historical extremes. These extremes include the wettest UK summer and winter on record (2012 and 2013), the most significant coastal flooding for a generation, the highest ever recorded groundwater levels and a conveyor of 12 storms which caused prolonged, widespread and severe flooding during the winter of 2013/14. This record breaking pattern persisted in 2015/16 when communities in the north of England were devastated by two extreme floods within 20 days. Accurate and timely flood forecasting was key in helping the emergency services to plan ahead and support communities when they needed it most. The FFC didn’t exist in 2007 when 55,000 homes and businesses flooded, mainly in Gloucestershire. 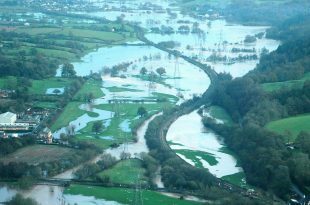 The Pitt Review, which followed the 2007 floods, recommended that the Environment Agency and Met Office develop a joint centre so that floods could be forecast with longer lead-times. This saw the creation of the FFC. With extra lead time the emergency response organisations and those at risk are able to reduce damage to properties and possessions. This helps communities to get back on their feet more quickly after floods. Every day the FFC produces at least 2,100 operational forecasts, more when the flood risk is high, for up to 10 days ahead. This information is sent to over emergency responder 3,500 customers. The flood forecasting service, capability and science has come a long, long way since 2007. Good flood forecasting requires great collaboration. We need to understand what is happening in the atmosphere, where the rain will fall and flow and whether it will cause flooding as rivers overflow. We also forecast flooding from the sea, groundwater and from intense rainfall that can flow over roads, land and overwhelms drains. The scientific challenge is immense, the communication challenge, I would argue, bigger still. I’m writing this blog travelling on the railway line that runs through Dawlish – you know, the one with the ‘washing line‘ hanging railway tracks in 2013. When it is flooding it’s obvious what our flood forecasting team does. A common question that we are often asked is what do we do when it’s not flooding. The short answer is that we work to understand what customers need of us and learn, develop and adopt new technology so that we get ever better. Being more than an operational centre is one of our strengths. It helps us to be a world leader in our field. We also produce flood risk guidance out to 30 days ahead, as even when the current weather is quiet, there are always patterns to monitor and judgements to make. That makes no two days at the FFC the same. I’ve been really fortunate to have a varied career in the Environment Agency. I’ve worked in diverse areas such as campaign management, project management, government secondments, operations management and even planning for incidents and emergencies during the 2012 London Olympics. 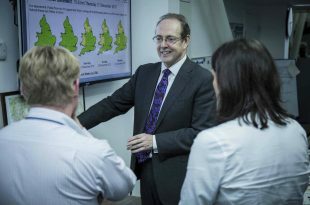 I’ve loved all my jobs, however, leading the Flood Forecasting Centre is my best job yet. The team, including all those who we collaborate with, is phenomenal. Floods still happen, but forecasting the risk of flooding and joining up the weather and flood information has improved greatly since 2007. Our work ultimately helps to protect lives and livelihoods. Crystal Moore is Head of the Flood Forecasting Centre (FFC), a partnership between the Environment Agency and the Met Office. Appointed in 2012, she has led the centre through extreme floods including the most significant coastal flooding for a generation and the stormy winters of 2013/14 and 2015/16. Everyone still has a responsibility to take action to reduce their own risk of flooding – check your risk and sign up for our free flood warnings at www.gov.uk/flood or 0345 988 1188.